Possibly the most theatrical and over-the-top hotel in London or anywhere else, Blakes nevertheless predates by two decades the current mania for individualist boutique hotels, and frankly outpaces them all, at least in terms of sheer eccentricity. It’s hard to imagine how shocking this place must have been when its doors opened in the late seventies, densely decorated as it is in an intense East-meets-East style, stuffed to the rafters with Chinese, Japanese and Indian antiques as well as the occasional Egyptian or Venetian curio. 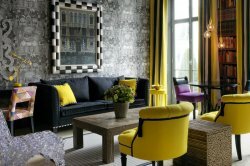 Somehow the design fever that has overtaken the hotel scene has failed to produce anything that can top Anouska Hempel’s eye for a maximally decorated interior, and in a world where blank walls and Scandinavian modernist furnishings represent the height of fashion, Blakes delivers the antidote to minimalism. Rooms are individually themed, whether British Raj or black-lacquered Oriental, and nothing is half-baked—in fact if you’re susceptible to sensory overload we can recommend something in white, like the Egyptian-themed Corfu Suite. Antique, of course, doesn’t have to mean uncomfortable—beds here are among the most sumptuous we’ve seen, many with canopies, and the marble baths are spacious and functional. Blakes restaurant is very much in demand, serving (no surprise) a fusion of Thai and Mediterranean cuisines; you can fight it out downstairs for a table for dinner, or just order in room service, and dine in your own private fantasyland. Either way, it’s guaranteed to be a unique experience—just make sure you’re ready for the unconventional. London has no shortage of more traditional hotels, and even Blakes itself has a quieter, more modest sister: the modern-Zen Hempel, just north of Hyde Park, may be the best way to ease yourself into the Anouska experience. The Chelsea Theatre is a single screen cinema in Kensington Park, a suburb of Adelaide, South Australia. The front entrance faces the Marryatville suburb and is seen as being part of the Marryatville business community. It was built in the Art Deco style, completed in 1925.